The Bridgend Castle Players started off in 1945 as The '94 Drama Club'. The two founders Albert Lloyd and Maurice Vivian Jenkins (known for being the best Amateur Director in South Wales) decided during 1946 to change the name of the group to reflect the area it represented. They first held rehearsals at the home of Albert Lloyd, 94 Coity Road before later moving to The Ship Hotel in Bridgend. We have since been bringing productions to our local stages and through that time, we have had many success stories. We have won various awards both as a group and as individuals as well as countless nominations for awards. "Evening of Remembrance" at Bettws Community Club. All proceeds from the evening will be presented to RAFA Wings Appeal and SSAFA. "A Plan of Attack" by Phil Nash. Sing-along with Maesteg Ukulele Band. Actual Letters from 'The Front'. Murder Mystery Evening at Bettws Community Club. "A Legendary Death" by Giles Black. Directed by Kelly Meek. "Hunchback of Notre Dame" Family pantomime written by Mark Davies. Directed by Mark Davies & Rachel Davies. Armistice Production - Blackadder's "Goodbyeee" by Richard Curtis. All proceeds from the evening presented to RAFA Wings Appeal and SSAFA. "Fair stood the Wind...For Aberbeeg" by Phil Nash. Armistice Presentation in conjunction with Nantymoel Community Association. All proceeds from the evening will be presented to RAFA Wings Appeal and SSAFA. "The Prisoner's Friend" by Peter Drake . "We will Remember Them" by Katherine Embling. "One Careful Owner" by H. Connolly. Directed by M. Smidman. "Snow White" Family pantomime written by George A. Smith. Directed by Mark Davies & Rachel Davies; Including pupils from BCP Youth at Betws Primary School. Armistice production in association with Llangynwyd Lower Community Council & Coytrahen Community Association. "The Prisoner's Friend" by Peter Drake and readings of letters from the front line to BCP Member's families. Armistice production in association with Bridgend County Borough Council. Sony Theatre, Bridgend College, Bridgend. An Extract from "Blackadder: Over the top" Directed by Mark Davies. 2014 "Jack and The Beanstalk" by George A. Smith. Directed by Mark A. Davies. Aberkenfig Welfare Hall, Aberkenfig, Bridgend. 2014 "Jack and The Beanstalk" by George A. Smith. Directed by Mark A. Davies. Betws Social Club, Betws, Bridgend. 2013 "Jack and The Beanstalk" by George A. Smith. Directed by Mark A. Davies. Cefn Cribwr Community Centre, Bridgend. 2013 "Jack and The Beanstalk" by George A. Smith. Directed by Mark A. Davies. Sarn Social Club, Sarn, Bridgend. 2013 "Who Killed the Director?" A Murderplays Murder Mystery Evening. Ogmore Constituency Labour Party Club. Directed by Martin Brawn. 2013 "Who Killed the Director?" A Murderplays Murder Mystery Evening. Ogmore Vale Non Political Club. Directed by Martin Brawn. 2012 "Aladdin" A pantomime written and directed by Steve Crawford. 2011 "From Here to the Library" Glamorgan Drama League One Act Festival, Dylan Thomas Theatre, Swansea. 2011 "Murder in the library" Murder mystery evening hosted at The Berwyn Centre, Nantymoel. 2011 "Cinderella" A Pantomime by George A. Smith 2010 Glamorgan One Act Festival, Dylan Thomas Theatre, Swansea. "From Here to the Library"
2010 Glamorgan One Act Festival, Dylan Thomas Theatre, Swansea. "What shall we do with the body?" (The Bea Wells Memorial Trophy for the best comedy performance) Won by Kate Barrett. 2010 "Dracula - The Panto"
2009 Glamorgan One Act Festival, Dylan Thomas Theatre, Swansea. "One-Sided Triangle"
2009 Glamorgan One Act Festival, Dylan Thomas Theatre, Swansea. "None the wiser"
2007 Glamorgan One Act Festival, Dylan Thomas Theatre, Swansea. "But Yesterday"
2005 See How They Run. Judith Richie & Kathy Siner nominated for "Glammies" Best Female performance. (Kathy . Shortlisted). Derek Traverse nominated for "Glammies" Best Male performance. 1994 Thursday 12th May. Maytime festival of Drama, Bridgend Recreation Centre, Bridgend. "Lend me a Tenor"
1993 Friday 7th May. 6th Llantrisant Youth Drama Festival. (BCP Youth) "Ernie's Incredible Illucinations"
1991 Tursday 16th May. Maytime Festival of Drama. Bridgend Recreation Centre, Bridgend. "Blood Relations"
1986 Thursday 22nd May. Maytime Festival of Drama, Bridgend Recreation Centre, Bridgend. "Scarlet Ribbon"
1985 Thursday 16th May. Maytime Festival of Drama, Bridgend Recreation Centre, Bridgend. "The Wind of Heaven" 1985 Sunday 5th May. Borough of Colwyn 37th Annual Drama Festival. Prince of Wales Theatre, Colwyn Bay. "The Wind Of Heaven"
1984 Thursday 22nd March Newport Drama Festival, Dolman Theatre, Newport. "Ghosts"
1983 Thursday 24th March. Newport Drama Festival, Dolman Theatre, Newport. "Everybody Loves Opal"
1983 Saturday 30th April Golden Jubilee Drama Festival, Albet Hall, Llandrindod Wells. "Everybody Loves Opal"
1983 GDL One Act Festival Preliminary round Thursday 7th April "Let the prairie echo"
1983 GDL One Act Festival Glamorgan County Finals Saturday 23rd April "Let the prairie echo"
1983 Friday 8th July. British All Winners Invitational Drama Festival, Dolman Theatre, Newport. "Everybody Loves Opal"
1981 Thursday 14th May. Maytime Festival of Drama, Bridgend Recreation Centre, Bridgend. "Abelard and Heloise" 1981 Saturday 9th May. 48th Annual Drama Festival. Albert Hall, Llandrindod Wells. "Abelard and Helouise"
1981 Saturday 16th May Borough of Colwyn 33rd Annual Drama Festival. Colwyn Bay. (We won every award) "Abelard and Heloise"
1981 March Newport Drama Festival,The Dolman Theatre, Newport. Abelard and Helouise"
1980 Thursday 15th May. Maytime Festival of Drama, Bridgend Recreation Centre, Bridgend. "The Late Edwina Black"
1979 Thursday 10th May. Maytime Festival of Drama, Bridgend Recreation Centre, Bridgend. "Saturday,Sunday,Monday"
1979 10th March. Newport Drama Festival "Saturday, Sunday, Monday"
1978 Wednesday 22nd March, 2nd Annual Drama Festival. Dolman Theatre, Newport. "All My Sons"
1978 Thursday 11th May. Maytime Festival of Drama, Bridgend Recreation Centre, Bridgend. "All My Sons"
1978 Saturday 29th April. 13th Ribble Valley Festival of plays. "All My Sons"
1977 Wednesday 11th May. Silver Jubilee Maytime Festival. Bridgend Recreation Centre, Bridgend. "The Young Elizabeth"
1977 Friday 6th May. 44th Annual Drama Festival, The Albert Hall, Llandrindod Wells. "The Young Elizabeth"
1976 Wednesday 28th January, Caerphilly Theatre Club, Caerphilly. " Sonnet for a Summer's Day"
1976 Saturday 1st May. 11th Ribble Valley Festival of Plays. "The Noble Spaniard"
1976 National Festival Association, All Winners Festival. *Second Place* "The Noble Spaniard"
1975 Thursday 20th November. Ammanford and District Arts Club Drama Festival, Welfare Hall Ammanford. "A Sonnet for a Summer's Day"
1975 Sunday 28th September National Festival Association. 2nd All Winners Festival, Prince of Wales Theatre. Colwyn Bay. *1st Place* "Sonnet for a Summer's Day"
1975 Saturday 6th December, Torfaen Drama Festival, Congress Theatre, Torfaen. "Sonnet for a Summer's Day"
1975 Saturday 6th April, Borough of Blaenau Gwent Drama Festival, Municipal Theatre, Beaufort. "Sonnet for a Summer's Day"
1975 Friday 9th May. 42nd Annual Drama Festival. The Albert Hall, Llandrindod Wells. "A Sonnet for a Summer's Day" 1975 Clitheroe Drama Festival *1st Place* "Sonnet for a Summer's Day". 1974 Wednesday 8th May. 41st Annual Drama Festival, The Albert Hall, Llandrindod Wells. "The Matchmaker"
1974 Sunday 19th May Dundalk Maytime Festival, Carrolls Theatre International, Dundalk, Ireland. "Those Damn Joneses"
1974 Saturday 19th October. 13th Annual Llanidloes Drama Festival. "The Matchmaker"
1973 Saturday 28th April. Ebbw Vale Drama Festival, Municipal Theatre, Beaufort. "Spring and Port Wine"
1973 Bridgend Castle Players represents the UK at the world festival of amateur Drama in Monte Carlo "Under Milkwood"
1973 20th October (Twelfth Annual Llanidloes Drama Festival) "Big Maggie"
1969 Sunday 18th May. Dundalk Maytime Festival. Amateur Drama International. Ireland. "Rose without a thorn"
1958 Festival of Wales Town Hall, Bridgend 24th - 25th September "The Wind of Heaven"
It is with deepest regret that we have to announce the sad passing of one of our longest serving members and Patron. Connie Say passed away on Friday 23rd February. 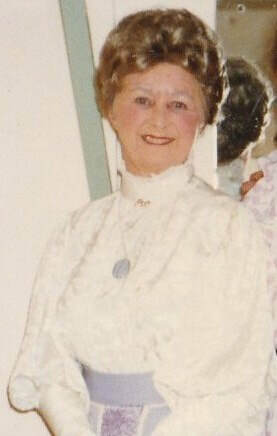 Connie had been a member & Patron of Bridgend Castle Players for many, many years & was an integral part of our society. She was Patron Secretary for 45 years! Connie was the last of the 'heyday' of Bridgend Castle Players. Connie will be sorely missed by all who knew her. She will be remembered with great affection & respect. Our hearts go out to all her family and friends at this sad time. Her funeral took place on Friday 16th March at All Saint's Church Penyfai, & at Coychurch Crematorium.